What’s better than a salad of delicious fresh greens? Only one thing: an organic salad of fresh greens. However, organic lettuces can be expensive and highly perishable when purchased regularly. So how about beating this issue with an easy and cost-effective way to enjoy the greens you crave? How about re-growing lettuce indoors from its head after harvesting its leaves? 1. Find a container narrow enough to hold the lettuce head upright, yet deep enough to support its growth. You can find a narrow, long container from a craft store which will hold a couple heads of lettuce in a row. Or, for one head, a wide-mouth pint-size mason jar should work well. 2. Make sure your romaine head is cut down to its base, with only about three inches remaining. 3. Place your lettuce in its container with enough water so that only about an inch of the plant is uncovered. 4. Place plant near a sunny window. 5. Change out the water every couple of days or so, and the plant will be ready to harvest in about three weeks. Several romaine heads can be re-grown at once. If you eat a lot of salad, having a collection of four-six romaine plants would be great. And an added bonus: You can enjoy the beauty of the plant as it grows, as well as the nutrition it promises. After reading Mother Earth’s information on this idea, I wondered if we could re-grow other veggie parts that would ordinarily be discarded. Turns out we sure can. 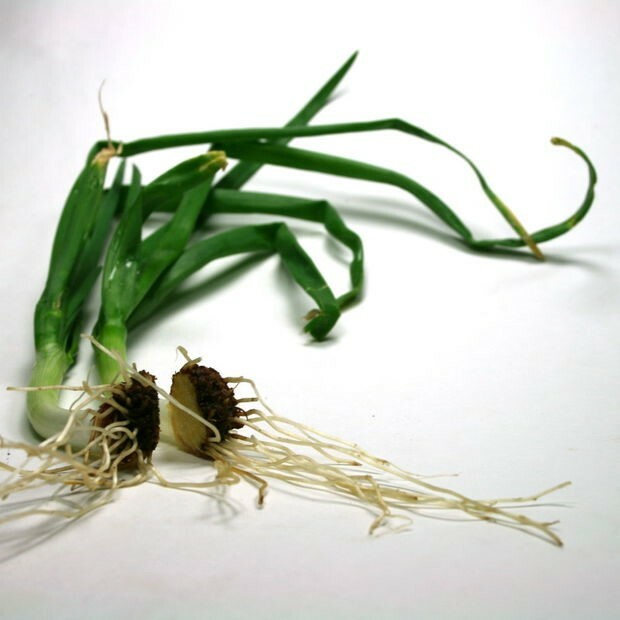 For instance, did you know you can re-grow onions—especially green onions (scallions)? You can theoretically create an endless supply of onions without ever having to buy bulbs or seeds; it’s easy and you can have a full bed of onions in no time. I went to a site, www.instructables.com, to learn how to do this. 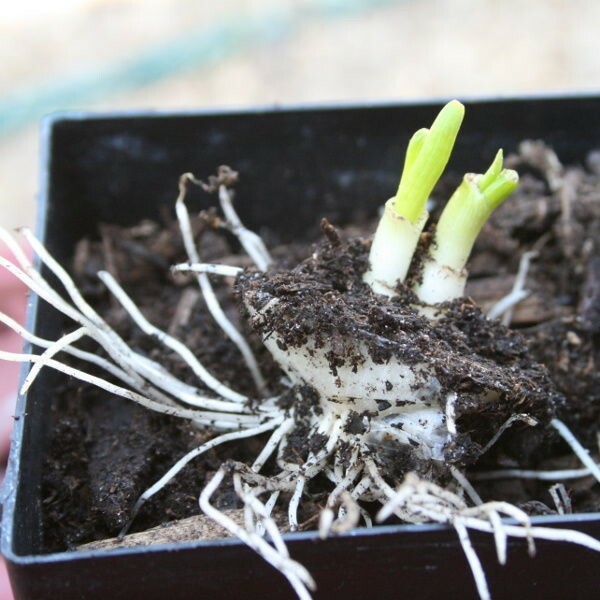 They say that in 3 weeks new roots will form on your onions, and the starts of leaves are forming (which can be seen by the two distinct rises at the top of the onion). And it’s very common for your onion to form two plants. After 4 weeks new leaves will form above the soil, and it will be clear that this plant will be able to be divided. It has now gone through a hard freeze in its pot sitting on a growing table. So to proceed, you’ll need your onion ends, a clean knife, a cutting board, a starter pot, and some potting soil. Chop off the bottoms of your onions leaving all the roots intact. This part is called the “meat.” The more of a bottom you leave on, the better. Try for 1½" to 2" of attached meat. Allow to dry for a few hours to a couple days in a shaded, well-ventilated area to allow for callousing. NOTE: You might only need a few hours for callousing. If the cut portions are dry to the touch and slightly shriveled, it very well might be calloused enough. And by the way: Since it’s gardening season, you can skip the starter pot if you can't be bothered and plant your onion meat directly in the ground. Once the onion bottom has developed a few leaves, remove from the pot and discard old onion scales. 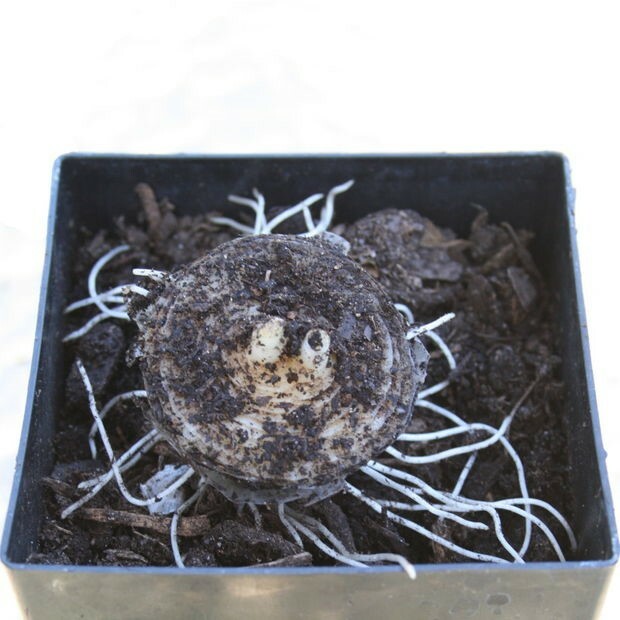 Separate plants as needed by slicing between plants and leaving a portion of the roots attached. And remember, you may have more than 1 plant develop from a single onion bottom. 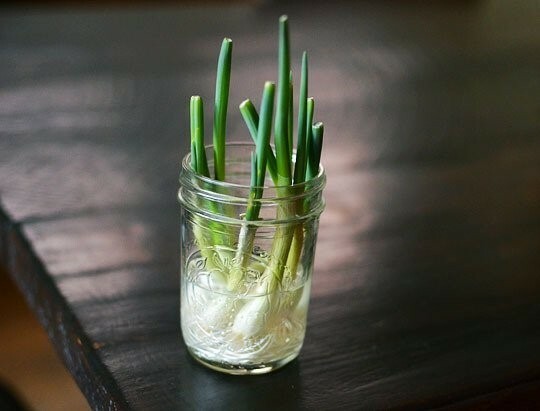 If you don’t want to place your onions in soil, you can grow them in a glass jar of water, as pictured. OR, if you want to replant your onions in a prepared growing bed, cut leaves down to 1/3 of the size to allow the bulb to develop. This might seem harsh, but the onion will re-grow those leaves with less stress. Then repeat the process. Harvest as green onions or fully developed mature onions. The expert that shared this information also said that you can do this with chives, basil, aloe vera, and if you’re in the right climate, even pineapple and sweet potatoes. What a fun and cost-effective approach to having organic fresh produce and eating it too!